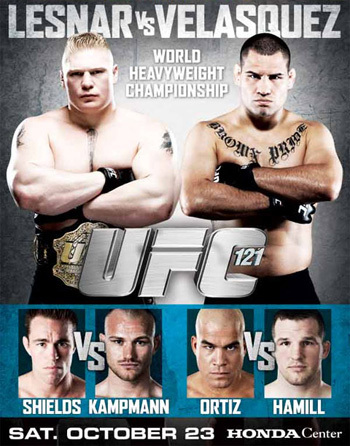 “UFC 121: Lesnar vs. Velasquez” took place Saturday night inside the Honda Center in Anaheim, California. Heavyweight king Brock Lesnar defended his strap against fast-rising stud Cain Velasquez in the night’s featured bout. Former Strikeforce middleweight champ Jake Shields not only made his long awaited Octagon debut in the card’s co-main event, but also returned to the welterweight division to meet the gritty Martin Kampmann in a critical contest. Speaking of comebacks, former light heavyweight title holder Tito Ortiz faced Matt Hamill in his first outing since undergoing neck surgery this past May.